Chinese online television and movie portal iQiyi has launched a social networking iOS app called HotChat where users can join chatrooms to discuss topics in trending TV programs. Have you ever wanted to talk about a television show that you have been watching but realize that your friends are not watching it? Enter iQiyi’s social networking app, a targeted IRC-like app that aims to gather people who watch the same show and get them talking about various themes. 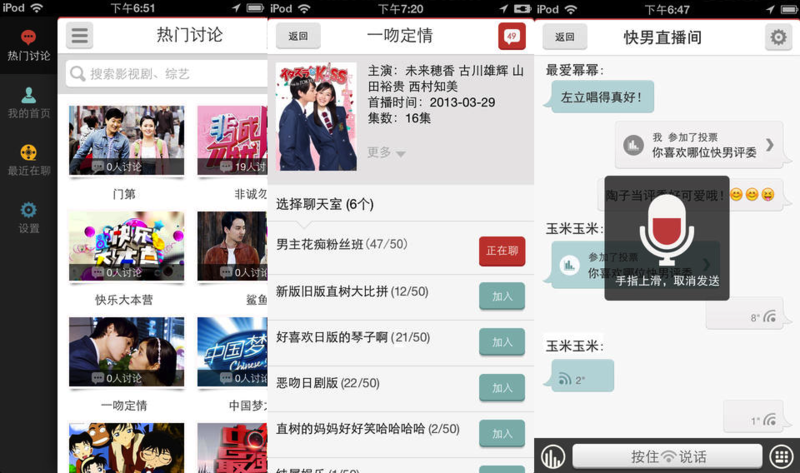 A peek into the app shows a topic “Who is the best-looking one” under the chatrooms listed for Super Boy, a Chinese singing contest aimed at discovering talented new male stars. There are plenty of other similar threads for anything you may want to comment on about a show, be it plot or characters. The app lets users type to each other and also features voice messaging. You can even set up polls for others to vote on certain topics surrounding the show. iQiyi already has a similar chatroom concept on the Web called T.Qiyi, but the mobile app will likely get more people talking (considering that China is the world’s largest smartphone market) and drive more engagement in iQiyi. The mobile-social strategy is key as competition has gotten considerably tougher following more consolidation in China’s online video space resulting in two main competitors — Youku-Tudou and Chinese search giant Baidu (which owns PPS Video and iQiyi). Following the billion-dollar merger between Youku and Tudou last August, Baidu bought a majority stake in Qiyi last November and in May this year announced that it would buy PPS Video for $370 million. However, data from Analysys — covering all devices — pins Youku-Tudou as having 30.2 percent share of China’s online video market, followed by Sohu on 10.3 percent, iQiyi on 9.7 percent and PPS on 7.1 percent. This shows that Baidu has much to do to catch up, and it is starting by moving into the social space for video watchers. Its latest move comes also after Baidu introduced an update to its map service that allows for in-app chatting. Last year, Baidu made steps to collaborate with the popular Sina Weibo microblogging service, announcing a new partnership to swap mobile and cloud-based search and content across their respective platforms.